If you must give up your home due to divorce, your lender may consider you for a foreclosure alternative known as a deed in lieu of foreclosure. A deed-in-lieu voluntarily conveys ownership to your lender in exchange for cancellation of the original mortgage agreement. Divorce may substantiate a deed-in-lieu agreement, but you must follow the lender's protocol and prove financial hardship to gain approval. The occupants of a home must vacate the property after a deed-in-lieu. In a divorce situation, the decree determines which spouse gets ownership and occupancy of the property. The spouse responsible for the loan must apply for the deed-in-lieu, but the legal terms of the divorce determine whether the remaining spouse can legally be forced out of the home. If the remaining spouse takes full responsibility of the loan upon divorce, he is solely responsible for applying for a deed-in-lieu in the event he can no longer afford the payments. A divorce qualifies as a financial hardship, according to Bank of America. 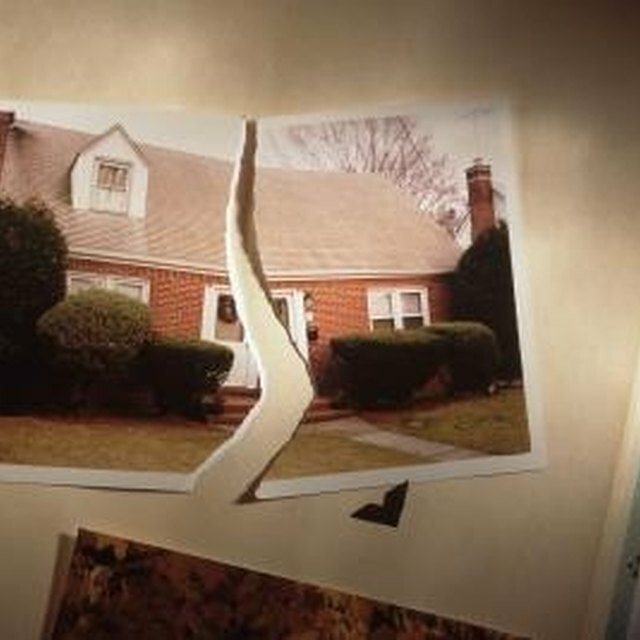 Because many married couples share the responsibility for a housing payment, divorce can severely impact a single spouse's ability to afford the home. A lender may extend a deed-in-lieu offer to a borrower who faces imminent default as the result of divorce. In general, a divorce in and of itself does not justify a deed-in-lieu, unless it hurts the borrower's ability to repay the loan. Resulting expenses, such as alimony, child support or loss of income, may lead to financial hardship after divorce. Early contact with your lender is advisable when applying for a deed-in-lieu. In general, the earlier you advise the lender of your financial hardship, the more options you have available. A deed-in-lieu is typically a last resort to avoiding foreclosure. Lenders usually pre-screen borrowers for loan modifications or repayment plans. Your lender may require you to attempt a short sale, a sale of your home for an amount less than what you owe, which also releases you from the loan obligation before allowing a deed-in-lieu. Can I Get Welfare Benefits Before I File for Divorce? Your lender requires you to supply financial documentation to support your hardship. Lenders require information from both spouses when both are obligated on the loan agreement. You must submit documents, such as pay stubs, tax returns, bank statements and a letter explaining your hardship within a specified amount of time. The lender may also require a copy of the divorce decree, separation documents or other legal paperwork outlining the terms of your divorce.